Encourage your clients to relax, knowing you've got everything under control, with this 15 oz. full color mug with four assorted tea bags! 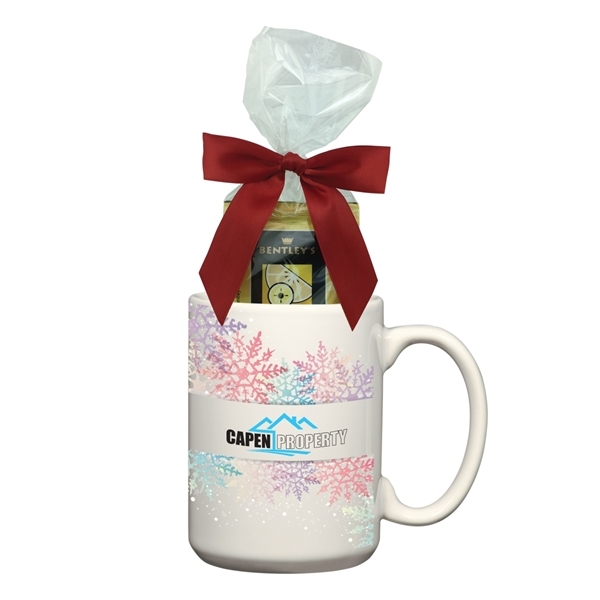 The stoneware mug can be customized with a full color dye sublimated imprint of your company's name, logo or marketing slogan and you can add a ribbon for the perfect finishing touch. It comes with four assorted tea bags. The mug is made in China and assembled and filled in the USA. Fully customize it with your own art or pick a stock design (silhouette, gold flakes, lights at night, country holiday, colorful snowflakes, snowman hello, snowy night or holiday lights)!